TweetVideoDownloader is one of the best twitter video conversion tool, where you can download any twitter video in a single click. The videos have multiple download format you can choose from. All you need is to copy the specific tweet URL and paste in the above-given field. On the next page, you will have multiple formats and resolution. Choose the resolution between HD or SD and click Download. The specific tweet video will be downloaded right after. How to SAVE Twitter Videos? You can easily save Twitter videos with our tweet video download tool. You don’t need to worry about the saving videos and selecting directory for the specific folder. Our tool will automatically download and save your Twitter video into ‘Download’ folder. Where you can easily share with your friends on Facebook, WhatsApp or Snapchat. You can also re-upload this Tweet video on to your profile and share with the Billion people. Steps: How to Download Twitter Video? 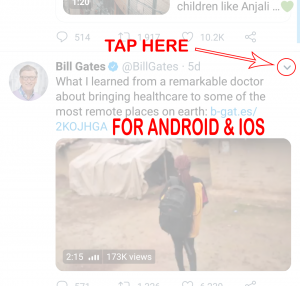 There are two ways to grab any Twitter video you like. We will share both ways. Choose the best and the easier way you want to download twitter videos. Both steps are simple and easy to understand. There you can download twitter videos directly. 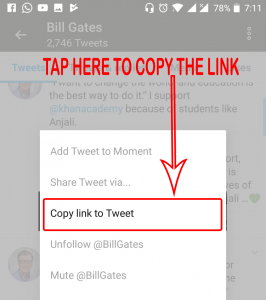 Note: The method of ‘copy link to tweet’ is the same on Android Tablet and Apple iPad. Move to the video clip you want to download. On the Next page, you will see the formats, Click download to proceed. Twitter is the social media platform used by 320 Million users every month. Whether it is used by famous people, Hollywood celebrities, Corporate offices or Billionaires around the world, Twitter is also famous amount average people.